Hey, thought I'd post a quick peek into what I've been working on these days. 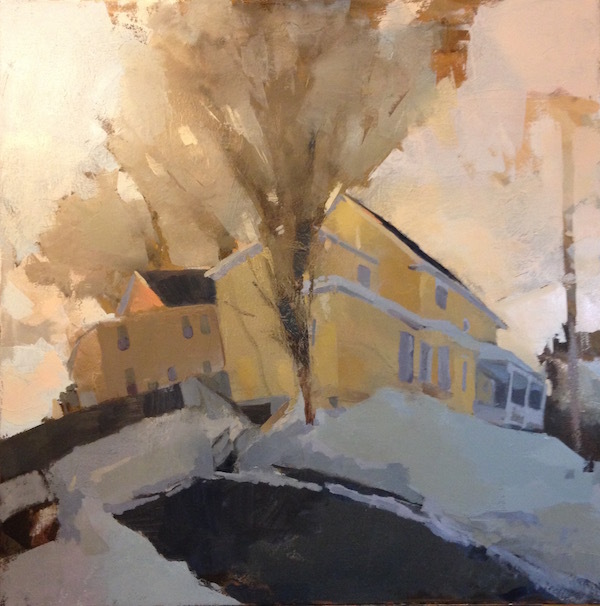 As part of an annual show, the awesome folks at Buoy Gallery in Kittery, Maine encourage participating artists to make one original piece of art, started and finished in the month of February. This show, ArtPM, opens with a reception on March 18th, 6pm, so if you're in the area, come check it out! More details available on their Facebook. 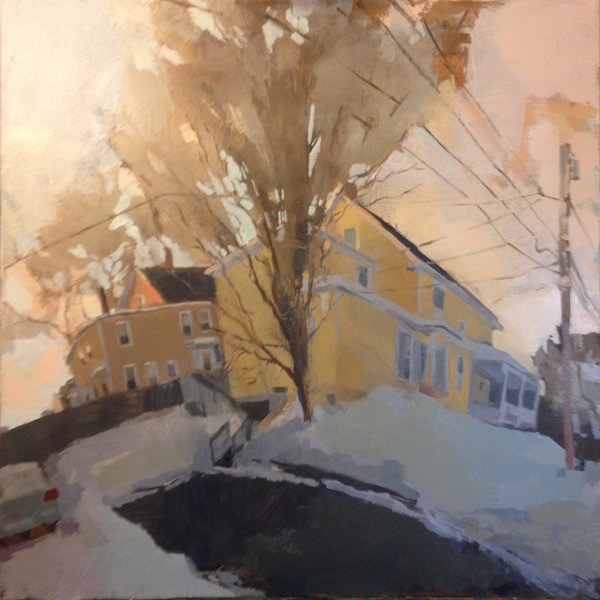 My painting, Corner of Hill, will be one of the works included at Buoy, so here's a quick slide show of my progress. The house of a friend & neighbor had all sorts of cool winter tones and I couldn't pass up such a great February scene. Proof of continued painting: a recent imagined landscape. Using perspective for these kinds of birds-eye-views has become a bit of a theme for me lately and gives me a fun challenge. It's definitely Google Maps inspired, but working from imagination lets me have much more freedom. I'm excited to be exhibiting several of my Italian landscape paintings in a group show, Travel: Home and Abroad. These landscapes were done during the summer of 2013, while I was visiting the beautiful city of Ascoli Piceno. The show also features work by a number of great artists of the region, including a friend and mentor from graduate school, Grant Drumheller. The opening reception for "Travel Home and Abroad" will be held on October 29th from 5 to 7 pm, at Macpage LLC, 30 Long Creek Drive, South Portland, ME. For more information, see Macpage's website. Even though I officially finished this painting in 2014, after sorting through photos, I enjoyed seeing the progression of my largest painting, Acony Bells, and thought I'd share. I started painting on this particular canvas in January 2013, but it started to move in a particular direction after I spent the summer painting in Italy and did a small gouache study of an invented pseudo-Italian mountainscape. This aerial view was really interesting to me, enough that I spent the next 5 months or so trying to translate it onto a much larger scale. During the earliest stages, I was focused on finding an overall composition that I liked, changing horizons and hillsides. The majority of the time after that point was spent on establishing a sense of atmosphere and distance. Some of the biggest changes, however, happened after being framed and with a week until it needed to be hanging in a gallery. Shown in the last 3 images, I glazed over large portions of the canvas, sanded and scraped down others, and added the birch trees and lower left houses that dominate the foreground. It was daunting to introduce so much change into a painting with so much already invested in it, but I'm happier with the result because of it. Acony Bells (1), 2013, oil on canvas, 54"x84"
Acony Bells (2), 2014, oil on canvas, 54"x84"
Acony Bells (3), 2014, oil on canvas, 54"x84"
Acony Bells (4), 2014, oil on canvas, 54"x84"
Acony Bells (5), 2014, oil on canvas, 54"x84"
Acony Bells (6), 2014, oil on canvas, 54"x84"
Acony Bells (7), 2014, oil on canvas, 54"x84"
Acony Bells (Final), 2014, oil on canvas, 54"x84"
After a short hiatus from posts, here's the latest from my studio. I have a new landscape in-progress that's focusing on those end of the day moments, when the light starts to do some amazing things. It's felt pretty therapeutic to be able to concentrate on all the small patterns that happen up close with so much plant life, especially on a larger scale like this. I'm planning to accompany the large paintings with a series of smaller studies that focus on those patterns and shapes. Expect to see some of these soon! I've been distracted from posting anything new lately for a handful of reasons. Fortunately, one of those things has been preparing an absurd number of new surfaces to start painting on, so it shouldn't be long until I have plenty of new projects started. At least, that's the plan. Until then, here's a quick monoprint of thistles. As possibly mentioned in previous posts, I've really been enjoying looking at landscapes on a much more micro scale, so this is a start in that vein. Out of landscape ideas today, so I went scrolling around through Google maps street view for inspiration, ending up on a corner in Boston. It's been a while since I last used street view as a reference, but I still enjoy what it allows me to do. I'm able to scout out lots of locations ahead of time or just paint from my studio, which comes in handy during bad weather. Plus, the overwhelming amount of places reached by street view really increases my options. However, the most interesting part of this reference for me is the distortion that its cameras have on the image's perspective and viewpoint. I've used it as a basis for my own experiments with perspective and it's ended up being a strong influence on my imagined landscapes. East 1st, monoprint, 2015, 5"x6"
Last week, I took a short road trip up to Acadia National Park in Maine with one of my brothers and a couple friends. I didn't find the time to do any painting on site there, but it gave me the push to work on more portraits, something I've been promising myself that I'd work on for a while now. I ended up taking a photo of my brother from the trip and building a different landscape around him from scratch. Like all the monoprints that I do, I find it interesting to compare the plate(left) and the final print(right), seeing which parts become more saturated and which details end up being lost. For those in the New England/Seacoast area who haven't already checked it out, my work is part of Everything Illuminated at the incredible Drift Gallery in Portsmouth, NH. The show features 2 other painters, Timothy Wilson and Kate Doyle, whose work is well worth seeing. It's a show that looks at landscapes in 3 unique ways and, as the title suggests, takes a great interest in light. In this show, my work is a personal experience of the landscape, drawing from past and present surroundings. Occasionally and often just in the back of my mind, I find myself in instances of great appreciation and content for the moments happening around me. As a response, I paint to recreate these moments and to find them in new ways. In a fight to reclaim this fast-fading inspiration, I often to turn to invention, relying on memories and whims to fill in the blanks left. I take something existing, in memory, in observation, or in both, and cast it in a new and personal light. I've been learning more about using oil paints in my prints, or at least trying multiple prints and investigating all the ways that they can fail. I've felt some progress in getting a larger range of values, a problem that's given me too many flat mid-tone prints. Because of the process, even pure white oil paint appears darker than the white of the page in a print. To solve this and to get lighter tones, I've had to work with the thinnest of transparent oil layers, often by painting a section and then wiping all but the smallest traces of paint from the plate. If you compare a recent monoprint with the plate used to make it, you can see some of the changes in value that happen during the printing process. In both, the green of the leaves stay a similar value because of the thinness and transparency used. However, because the yellow of the dandelion relied on opacity, it darkened and flattened out after being pressed. A problem found and hopefully avoided in the future. Prints are still in the works, but it's not too often that I do much with figures, so I thought I'd share today's painting. Rain and cold put a end to any beach plans that I might have had, so instead I sketched with a friend in a local coffee shop. Having seen others use it in the past, I decided to try painting with coffee. Although fairly similar to most inks or watercolors, I found a few differences in working with it. The coffee had a tendency to pool at the edges, rather than dry into a more even tone like most inks would and seemed slower to dry. Also, where as inks and watercolors can layer on top of themselves to create a range of tones, the coffee I used was pretty limited in this regard, meaning that the sketch stayed fairly light. Although I'm not particularly concerned, coffee isn't particularly archival, so it probably won't have the permanence of inks. All things considered, I enjoyed the small differences and might give some more non-traditional media a shot in the future. It's felt like a while since I worked on any prints, so I'm making an effort these next few weeks to crank out as many as I can. Monotypes mean that I can't get carried away with retouches and drawn out sessions like I find myself doing with some paintings. After a period of longer studio paintings, short and sweet is just what I need. I picked up where I felt off with the paintings and returned to the pine tree motif for the first of these monotypes. Here's a general overview of the progression of one of my recent paintings. It originally began as a quick oil sketch of my house from memory, as I sat inside ignoring the several feet of snow outside. I was more interested in making an interesting painting than accurately reproducing my street, so instead my house became this framework off of which I could build something original. Working almost entirely from memory and invention, I adapted a few different perspective techniques, gave myself some rules and found excuses to break them; anything to keep that initial spark of interest going. I wanted to keep all possibilities available and didn't tie myself to the truth. Without much direct reference, I felt more free to alter things and invent my own additions to the neighborhood. After a few stages of changes, here's the result. If you haven't already noticed, I've finally updated the home page with new paintings, under Recent Works. Some of these I've already included in past posts, but there's also brand new images, so be sure to check them out! If you're interested in seeing it in person, this body of work will be included in a show at the Drift Gallery, Portsmouth, NH, opening June 13th. In other exciting news, I found out in passing that I've been nominated for the seacoast's Spotlight on the Arts Awards, under the category of Outstanding Painter. The other nominees, some familiar and some new to me, are all fantastically talented and I'm flattered to be included in such company. You can read more about the awards and the other nominees in this recent article by the Portsmouth Herald. There's a certain section of road that I drive by on almost a daily basis. Because of my routine, I typically end up passing by at the end of the day, when the sun is just beginning to think about setting. With the pines silhouetted against it, the light creates a wall of negative shapes; this collection of windows that stream past my car. The effect reminds me of a church's giant stained-glass windows. It's really just a few seconds, glancing by and then gone until the next drive, but the image has stuck in my mind enough that it led to this painting. With the blue sky monotypes from March still floating around in my head, I felt the need to try something similar on a larger scale. The way that the paper reacts with the paint in the prints gives the color an interesting saturation and I've tried to match something similar. Having more control over the process at this scale and medium, I think the painting has more atmosphere than the works that came before it. Moving from the original several inches of the prints to 2'x4' definitely gave things a different feel, and although I've tried to hold onto those things that I originally enjoyed about the prints, I find myself missing some of the spontaneity and looseness that happens more freely on a smaller scale. All in all, I'm still happy and plan to see what else I can learn from this back and forth of scale. After staring at a big blank 44"x56" canvas for too long, I finally managed to get a new landscape rolling. I always push myself to find fresh and interesting ways to compose the landscape and I consider this latest painting a good example of that. Some of the detail is lost condensing it into this photo, but I've really enjoyed focusing on a much closer view of the landscape. Since most landscapes that I've painted in the past simplify fields of grass into broad planes of color, treating that huge mass of plant life more intricately and closely has been a refreshing exercise. As I move forward, I definitely plan on exploring this micro/macro view more. After a recent hike, I decided to take advantage of the last remaining snow before it finally melted and started this new landscape. Trying to capture a specific instance of light and time of day is always an enjoyable challenge, especially with snow in the forest. Because of lighting, snow almost never ends up being pure white, so the painting becomes about looking past the local color and finding the right relationships of warm and cool. I've got a fresh canvas stretched and ready to go, but since it's large by my standards (43"x55"), I'd rather have some ideas and studies in the works before I start throwing paint at it. I enjoyed making the blue sky monotypes that I posted the other week and given the increasingly nice weather, starting something similar feels appealing. So, here's the first attempt in planning something larger in this vein. My painting Acony Bells was recently featured in a wedding at the Drift Gallery in Portsmouth, NH. Although the landscape was previously sold, Acony Bells' owner was kind enough to lend it out to be the backdrop for this ceremony. Drift Gallery is a beautiful space and made for a great wedding location. I'm glad to have been a small part of the couple's day and wish them the best. Check out recent projects and works in progress. Paintings, prints, drawings, doodles, and anything in-between, all documented in my blog. Follow me below on Instagram for current happenings. More banyan trees from this afternoon’s class, plus dolphins. Banyan trees are the best (ignore the weird margins, I forgot my sketchbook and used an old demo board). Things easily found in Florida: Palms and trash cans. Things not easily found in Florida: Shade and hills. I had the afternoon off from teaching landscape painting, so naturally I went landscape painting.